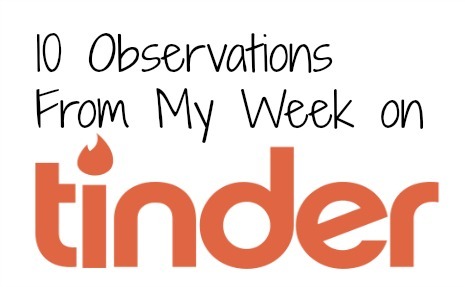 20-Something Bloggers just popped into my email and I saw “Just a few observations I made from the 1 week I spent on Tinder”, and I thought this girl doesn’t know it yet, but we’re about to become best friends! This post had me dying. New reader, for sure! Heeyyy new bestie! Thanks for stopping by. I was just checking out your blog and you are hilarious. I like my friends funny so this friendship should work out perfectly. Lol! I loved this post! I’ll admit, I’m a tinder-holic. Seriously, I love it. I’ve been out on loads of dates from it, even saw a few of them a second time surprisingly. It’s just so easy to use. It’s like a modern version of hot or not and you don’t have to pay for a premium membership to be able to shoot them a message. It’s great! But yes, I totally judge them by our mutual friends and interests too- that’s just a natural instinct isn’t it? I also tend to use social media such as dating websites and apps as some disjointed form of networking. I’ve met so many new and interesting people through online dating- although there was no romantic spark with most of them. That’s okay though, now I have some pretty awesome friends instead. I tend to have better luck with OkCupid to be honest. Thanks for stopping by Saphfyre! Maybe I will have to give OkCupid a try next.